I’m so glad it’s done!!! In the past I haven’t had the time to devote to one garment like I could with this one. I have extricated myself from many of my husband’s companies and now for the first time since I bought The Stitchery in 2005 I am not acting as an Administrator or Business Manager. 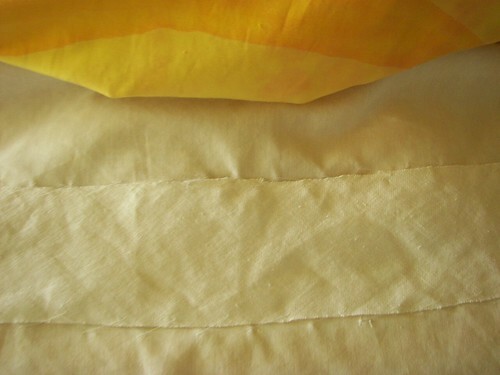 I am a simple sewist, sewing as the orders come in or sewing for just me. 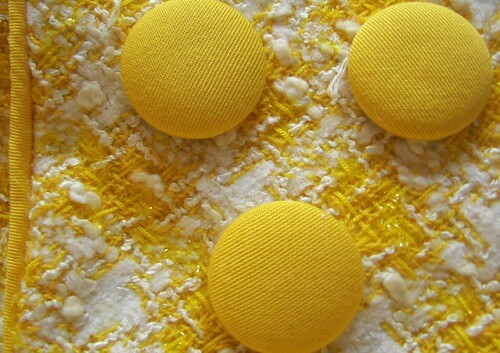 I wish I had the energy to sew for the public but I’m not recovered enough from cancer yet. Sorry for the grim look on my face! I am not an axe murderer and my best friend did not just pass away…I made a mistake of staying up all night stitching (explanation below) and haven’t recovered yet! I did lots of hand stitching on this coat to turn it into the garment I intended. It feels wonderful, sitting just right on the shoulders, and lightweight enough to wear during slightly chilly Southern summer nights. Els (of The Sewing Divas) suggested piping around the yoke and she was right, it adds just the perfect touch to define the yoke shape. 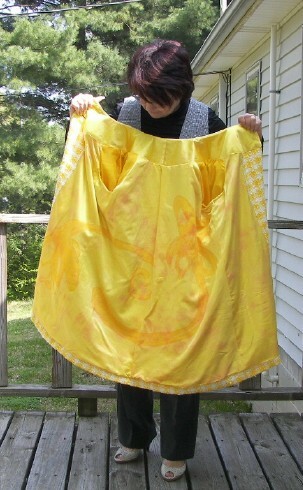 I’m so glad I had the brilliant yellow silk twill from Nancy Erickson to make the buttons and piping. 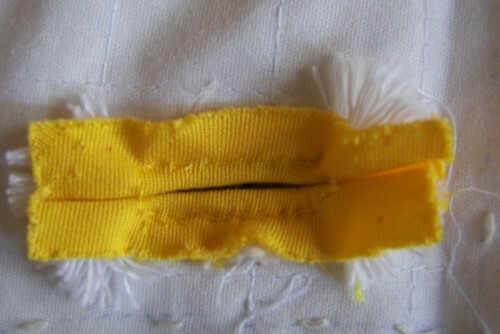 I used Paco’s instructions on how to make a bound (or welted) buttonhole and Summerset’s tutorial on added cording to the welt. However, the rat tail cording did not give the welt enough body so I had to insert two strands. It was a tight fit! Sigh. Perfection can cause me to obsess beyond all reasonableness. 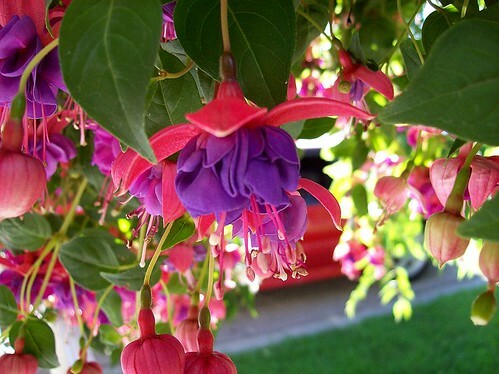 On the front lining piece I attempted to paint a fuchsia. 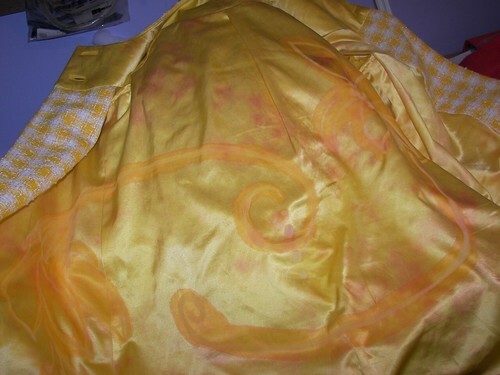 It’s not easily visible but it does make the blotchy lining look better. It’s not the same as the line drawing nor my coat. 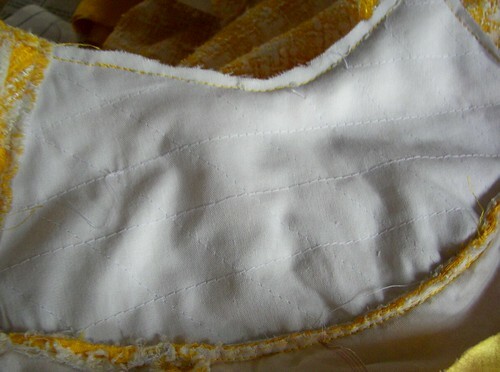 I narrowed the width of the front yokes by about .5″ but the neckline is not scooped out like in the picture nor are the sleeves drawn in so close on the shoulders. 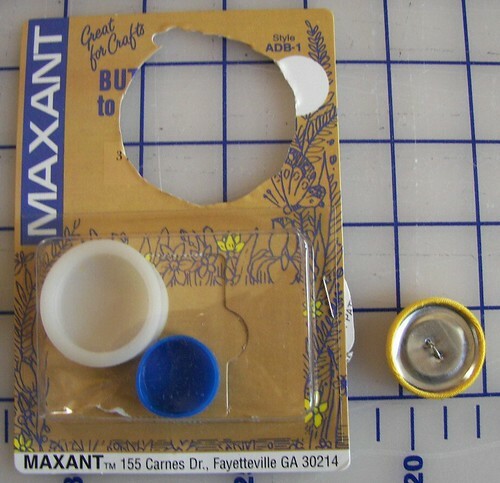 The pattern instructions were very basic and simple. There was no instruction for padding out the sleeves yet it did call for .5″ shoulder pads. 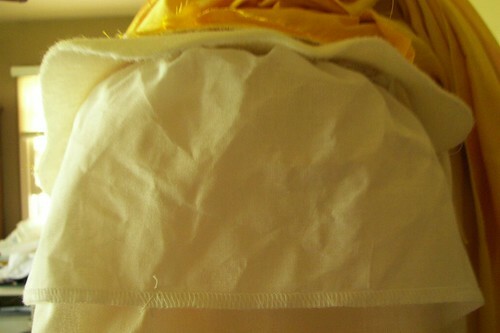 I found I didn’t need the shoulder pads and had to add stiff sleeveheads and when that didn’t provide enough body to keep the checked fabric from drooping down my arms, I added a 5″ wide organdy undercap to shore up the sleeve. It was a good thing that I interlined this whole coat with a stiff woven underlining. Believe the line drawing, not the picture. 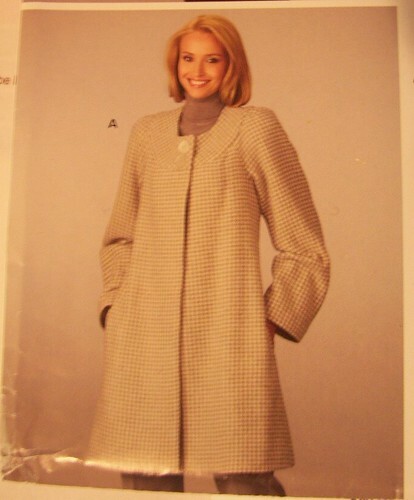 And do not attempt to rely on the pattern instructions to give you the kind of coat that will look well done after you are finished. For example they instruct you to machine bag the whole lining. I think the end result would be a very soft but shapeless garment. 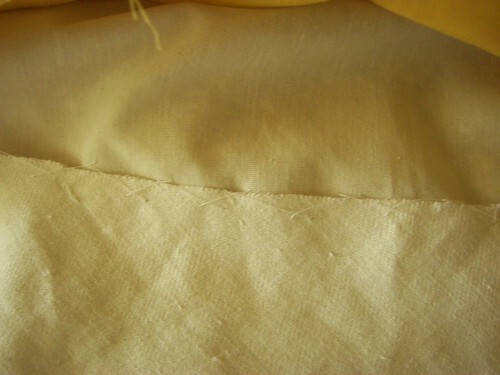 and catch stitched the linen to the interlining. 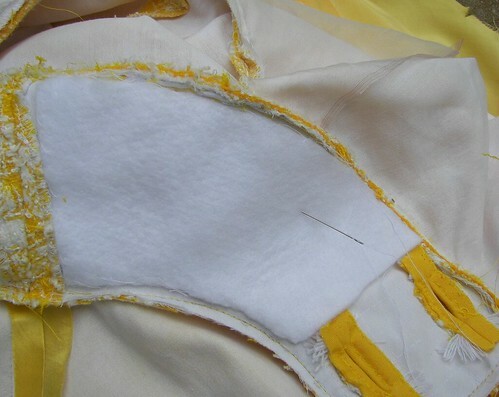 But for some dumb reason I guessed at rather than accurately measured the proper placement of the linen and stitched the whole thing in so that the coat would end up to be too short! I had to take it all out and move it down and I wouldn’t give up on reaching my self-imposed sewing goal. Therefore as my Husband was getting up at 5 am to go to work he caught me stitching in front of the TV! Ohhhh, dumb and dumber! I am beyond the age where an all-nighter is easily recovered from. 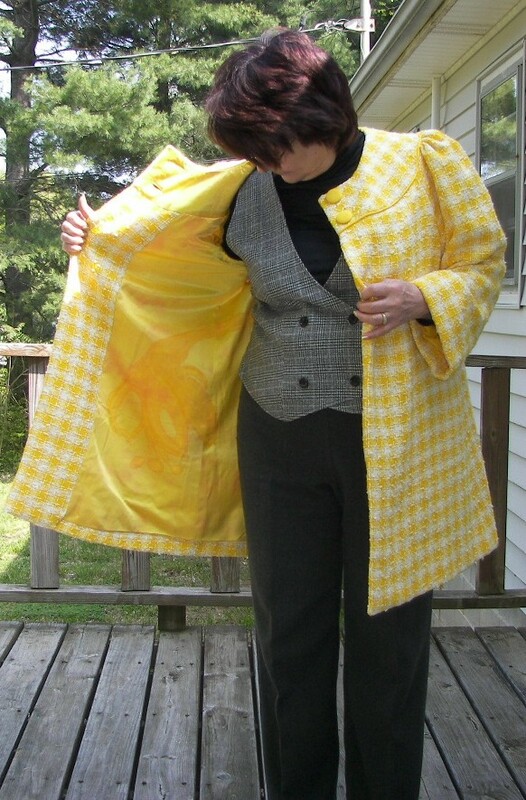 I have learned a tremendous amount in doing this coat and am so glad that I could finally take time with my sewing to use some of the techniques I have been studying for so long. I’m in shock that I’ve chosen to use such a bright color for this gigantic project but am quite happy with the result. Now I can clean up this totally destroyed sewing space! Ahhh, what’s next? a simple white shirt perhaps? 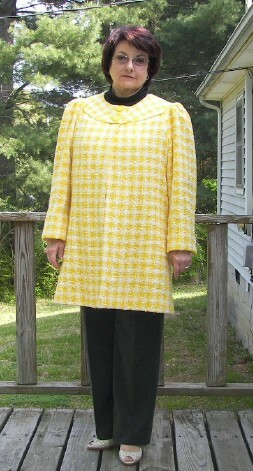 MaryBeth , the coat is lovely on you and the yellow color suits you very much. The sewing techniques and a lot of brainstorming you used for this coat makes this a timeless piece for many more years to come. That is tailoring and your persistence to make this fabric and pattern work for you. Enjoy your new fab coat. MaryBeth, it’s so lovely. You can’t see me but I’m on my feet giving you a standing ovation. I won’t ask for an encore right away. Thank you for sharing the journey. I’m so happy you’re thrilled with it too. I am in awe … really! I don’t think I would have the patience to do this amount of work right now. The results are absolutely amazing. Your coat is beautiful, and very becomming. Outstanding! Now, maybe you can get a good night’s sleep! The coat looks absolutely amazing on you! Huge congrats on the effort you have put in – definitely a labour of love! It looks great! Obsessing sometimes becomes us. Excellent technique–really paid off. Wonderful pictures and descriptions of your work. Marybeth, you are right: everything is perfect in this coat. The exterior and the interior is nice also, with this print of flowers (here in Spain called “queen earrings” to this plant). Thank you for trusting in my tutorial …., really. All the extra care in construction make your coat exceptionally beautiful! It is beautiful and you look wonderful in it! All the extra work and attention to the details makes all the difference in the world. Thanks for the kind words, you all. I’m really appreciating the your comments. It’s raining now and has cooled down so this coat might come in handy soon. I really don’t have any lighter weight spring/summer coats and I was hoping this week’s heat wave wouldn’t last too long! What a beautiful masterpiece, Mary Beth!! It’s worth all the time invested in it! You look terrific, the coat suits you so perfectly! What a beautiful beautiful coat Mary Beth. It looks lovely on you and seems to be well worth the obsessing. Now you have something you can treasure for a long time. I think the lining is brilliant. Your coat is beautiful! It fits you perfectly and I love the lining. I love the proportion you have acheived with this. Thanks for all the documentation of your process, its good to know about the insides -as it is what permits this coat to hang so nicely. What a difference all those fine touches make. 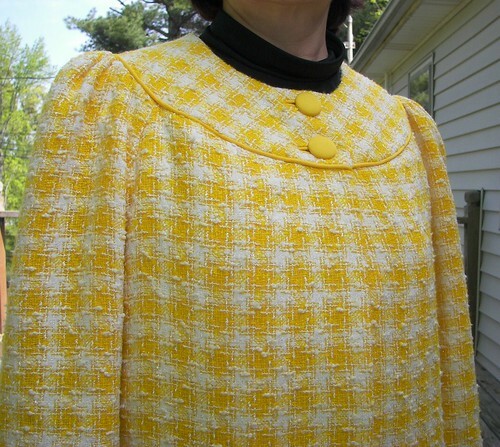 Perhaps as a 7/8s length coat over a linen sheath in white or lemon? Meet me on the deck for a whisky sour, straight up. Wow – you look like a ray of sunshine! What a marvelous job – thanks for showing all those inside details. Phew, this was quite an adventure, but this is really beautiful! You look great in this coat. Oh my goodness! What a fabulous coat! I love all the intricate detail work. 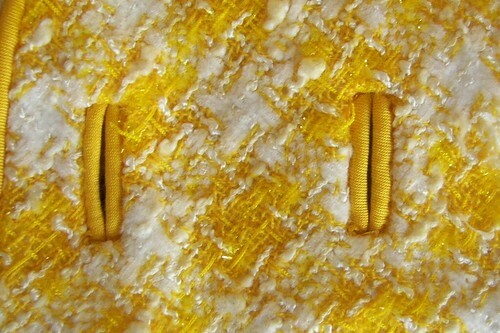 This is the way I want to sew. Oh, I’m jealous!